2013-10-10: The little one seems to be very comfortable. The wife, not so. She’s been walking-up a storm (sometimes with me, sometimes with mom) trying to coax it along. Told me today after dinner that she was a bit frustrated with the waiting. I didn’t get a pleasant response when I put up my hands and said, “well, honey, that’s between you and the baby”. Must work on my diplomacy skills. The again, if little one is a girl, and there’s still one vote out there for that, kinda renders the whole argument moot. There was also thinking that boys are typically early, and since everyone but jimg voted for a boy, it should’ve happened by now. Oh, a friend told us that she was ten days late… I disrememberd to ask if she had a boy or a girl. Anyway, the Ayi just cooked food, and I gotta join mom, Shanshan, and little one at the table. 2013-10-03: Shanshan feels the same as she has for the past few days. Pressure, but that’s about it. 2013-10-01: Thanks to my friend jimg, we now have a vote for a girl! w00t! 2013-09-30: The visits to the doctors went fine yesterday. We’re now into the final week. Shanshan feels basically the same, aside for some additional pressure on her pelvis. She thinks that the baby will be born this week. Starting tonight, mom will basically staying with us for the duration (taking breaks here and there). Dad will most likely be coming over occasionally for meals. We’re both very glad for the support. Oh, yet another person told Shanshan that she’ll be having a boy. That’s about 5,000 for a boy, and zero for a girl. 2013-09-29: Left the home at 06:30. The folks picked us up. Necessary to arrive at the hospital as soon as possible so we can get in line to obtain a number for Shanshan to get the soon-to-be baby’s heart monitored. Only the first ten people in line will be able to see the doctor in the morning. The rest will have to wait until the afternoon. I think that Shanshan got number 12. She’s going to check back at 11:00 to see if they might be able to squeeze her in. Otherwise, it’ll be late 13:00 or 14:00 before she’s seen. She’ll also be talking with another doctor about the general condition as we head into our last week before the baby is due (2013-10-07). All in all, Shanshan is doing extremely well. Not much change over the last two or three weeks. Some lower back pain, but that’s somewhat a given considering how low she’s carrying. Oh, we had yet another person — this time, our female neighbor — suggest that we’re going to have a boy. 2013-09-26: The wife and I had dinner with my boss and a couple of co-workers from the USA last night. Great time. During the evening, we talked about names for the upcoming baby, and Shanshan let it be known that she wasn’t exactly thrilled with the American name of Bruce (I’d chosen Bruce because of Bruce Lee, who will share the same Chinese given name with our baby, if, of course, our baby turns out to be a boy). I wasn’t exactly wedded to the name. The wife said she’d prefer the name of Derek. The boss and others around the table (including me) agreed. So, that’s it. We’ll still have the nickname of Chong Chong (meaning worm), which we’re already using. Folks at the table were joking that this’d make a great fighting name if the kid ever took-up the sweet science… and, in this corner, Derek “Chong Chong” Su! 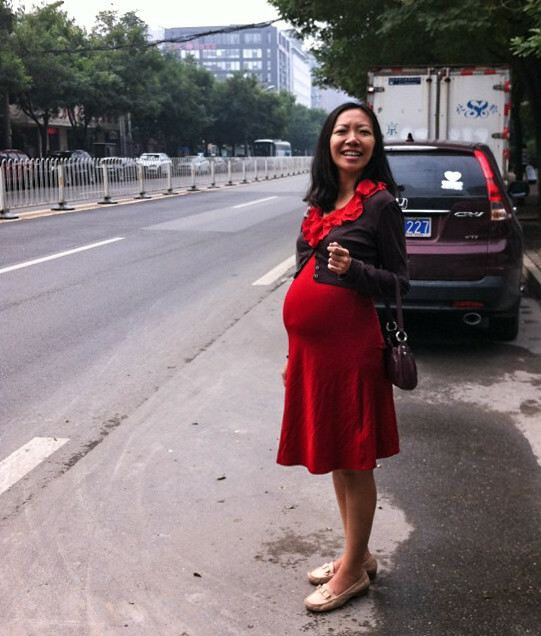 2013-09-24: Shanshan, mom, and I talked a bit about the post-birth schedule. The Yue Sao will be here continuously for the first month. Then, if the baby is doing okay, she’ll take one day a week off for the rest of her time with us (two more months). Our Ayi will be here her regular Tuesdays, Thursdays, and Saturdays. And, as per her usual schedule, she’ll clean and cook dinner on Tuesdays and Thursdays, whilst only cleaning on Saturdays. The Yue Sao, is tasked with two things… taking care of the baby, and taking care of Shanshan (for the benefit of the baby). As part of this, she’ll be cooking, but only for them (gotta have the right intake to provide the right output; that is, milk). Mom will come over on Mondays, Wednesdays, Fridays, and Sundays to be with the baby and cook for me. Dad will also be along. We’ve rented them a car, which he drives, so the trip only takes about 15 minutes for them. I’ll try to fend for myself on Saturday, or convince the Yue Sao to toss some scraps my way. Anyway, although things could change in the next couple of weeks, I’m glad we’re not looking at a c-section. We’re leaving for the hospital at 6:30 am on Sunday to do some more testing. 2013-09-22: Shanshan waiting for a taxi this weekend. Our friend Pascal said that it looked like she should be waiting for an ambulance. Still a little over a week until her due date. 2013-09-18: Shanshan has a suitcase packed for her trip to the hospital. She has two rolls of toilet paper in it. During her last stay at the hospital (a couple of years ago, and in an old wing), the patients were required to bring almost everything they would need, including toilet paper. During that time, she shared a room with seven other women, with a single bathroom between them. And, by bathroom, I mean a very small room with a toilet and a shower-head that sprayed directly onto the tile floor. There were no curtains between the beds. So, whenever one of the patients needed to have a procedure done that required a bit of privacy, the male visitors were shuffled out of the room. Also, there was one broken IV wheel-stand for the room. So, when the women needed to walk around a bit, family members would walk beside them, holding the IV bag above their heads. I’d don’t expect the same conditions in the new building, however. It was just completed and seems wonderful. 2013-09-16: Shanshan and her mom (hereafter referred to as just “mom”) went to a seminar at the hospital today. She’ll be expected to stay in the hospital for three days after giving birth. There will be six women to a room in the maternity ward. No visiting hours per se. Meal times 7 am, 11 am, and 5 pm. A family member will be allowed to bring-in food at that time and stay for thirty minutes, so we’ll be rotating through to see her during those slots. When she’s feeling up to it, Shanshan will be allowed to come with the baby to outside the maternity ward and visit us there. No word on the frequency.